In addition to the options listed here, you can use the configuration option TerminalPrompt, which controls the Terminal prompt. This option is available in the Management Portal. To find it, select System Administration > Configuration > Additional Settings > Startup. For example, the Terminal prompt can include the configuration name of your system. To specify the font size to use, select Edit > Font. 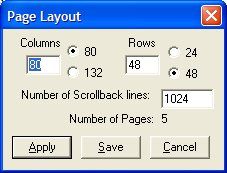 This displays a dialog box where you can select a typeface, size, and style appropriate to your monitor and resolution. If you choose a font size that would expand the window beyond the borders of your screen, the Terminal automatically resizes both screen and font to the largest size available. Also, whenever you switch to a different size screen, the Terminal attempts to use the preselected font for that size. Apply changes only the current Terminal. Save does not change the current instance but saves the color information for new instances of the Terminal. You can adjust the colors from the expected ANSI-named colors to any colors that the display board can deliver. These colors are saved along with the foreground and background choices. To select the default colors, select Default and then choose the colors. Save does not change the current instance but saves the window size information for new instances of the Terminal. When you change the window size, the Terminal erases all current data in both the current display page and all back pages. Further, if there is a font selected for that size, the Terminal selects it. To define custom key combinations, select Edit > User Keys. This displays a dialog box where you can associate an ObjectScript command with any of the following key combinations: Alt+Shift+F1 through Alt+Shift+F10. Selecting Ok+Save updates the current instance and saves the key sequences for future instances of the Terminal. To include a non-printable characters in the command, use the decimal equivalent (nnn) of the character. You may also use one of <CR>, <F10>, <F7>, <DO>, <TAB>, <LF>, <ESC>, <CSI>, <NL> (= <CR><LF>). You can also use <P1>, <P2>, and other command line parameters. There are known problems with the User Keys facility. For up-to-date information, please contact the InterSystems Worldwide Response Center (WRC)r.
Pass XOFF Through Let remote host handle XOFF/XON. Windows edit accelerators Specifies whether the Terminal enables the common Windows edit shortcuts (Ctrl+C, Ctrl+V, Ctrl+Shift+V), in addition to the basic Terminal edit shortcuts (Ctrl+Insert and Shift+Insert). If these Windows shortcuts are not enabled, the characters are passed in the data stream to the InterSystems IRIS server process. Some systems cannot accept data as fast as the Terminal can send it. Thus, the Paste burst size determines how much to send at once and the Paste pause time determines the pause time between transmissions. If either setting is less than 1, the entire clipboard is sent at once. When the Terminal translates keyboard input into its display memory, which uses Unicode. Characters received from the keyboard are translated from the single or multibyte character stream using the current Windows input character set. This means that if you change your input language, the Terminal recognizes the change and adapts to it. This enables you to type in mixed languages; the Terminal recognizes it and translates properly into its internal Unicode representation. If you use mixed-language input, select UTF8 as your network encoding and your InterSystems IRIS $ZMODE I/O translation table. When the Terminal communicates with a peer server. Characters transmitted to the server are translated from the internal Unicode representation to a network encoding and characters received from the server are translated from the network encoding to Unicode. The default network encoding is UTF8. To specify the network encoding, select Edit > Network Encoding. This displays a dialog box where you can choose the network encoding for the Terminal to use. There are 4 choices: UTF8, Windows, ISO, and EUC. Because these encodings are not all relevant to every input locale, only the relevant choices are enabled on the menu. When you select the UTF8 option, the Terminal translates the internal Unicode characters to UTF8 on output to the server and from UTF8 when received from the server. If you select UTF8, the InterSystems IRIS I/O translation for your principal I/O device must be UTF8. You can determine the I/O translation from $ZMODE. It is the fourth field; fields are delimited by backslashes (\). When you select the Windows option, the Terminal uses the current Windows input code page to translate I/O between the Terminal and the server, to and from the internal Unicode character set encoding. When you use the Windows encoding, make sure to set the InterSystems IRIS I/O translation ($ZMODE) to that it expects the character set represented by the active Windows code page. All other Windows input code pages use the Windows code page if the ISO network encoding is selected. When using the ISO encoding, you must ensure that the InterSystems IRIS I/O translation shown in $ZMODE is consistent with the character set represented by the active ISO code page used by the Terminal. Japanese (JIS) support is provided under the ISO network encoding using the 50220 code page to translate to/from the internal Unicode. To specify the physical character setting, select Edit > Display Physical Character Setting and then select either Logical and Physical. This option controls the aspect of the characters displayed in the Terminal window. The difference is apparent only when using multibyte character sets.